As a rule, if a political or social idea vastly swoops above one’s head, it is polite to lower said head and pretend to text on one’s phone while it is discussed by others with the knowledge and understanding to do so. Unfortunately there is a group of women out there who possess the ability to use Tumblr but not, sadly the ability to research one of the most iconic movements of all time ; these are ‘Women Against Feminism’. 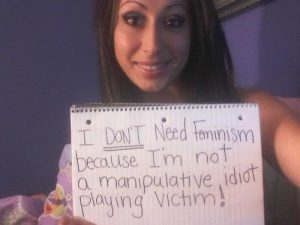 ‘The Women against Feminism’ Tumblr began in July 2013 and it encourages women to hold up hand made signs declaring why Feminism is not for them. Fair enough, whatever you’re having of a Sunday but declaring on the internet beside a massive picture of your face, a nugget of wisdom such as ‘Blaming men for everything is bad’ makes you look like a total Gobsheen..Just saying. This is where the ‘Confused Cats Against Feminism’ Tumblr offers relief. It’s not just women who have become confused by and believed untruths about feminism..Cats have been misled too. ‘We Hunted The Mammoth’ a blog that addresses online misogyny created the Tumblr in response to what they felt was a very confused reading of what feminism is. By having cats express their view on the matter, the misguided intentions of ‘Women Against Feminism’ glare.. Please now enjoy a selection of Anti-Feminist cats embarrassing themselves.. PREVIOUS ZomBeavers ; Raunchy, Ridiculous Fun!